On February 13, 2017, Liberty "Libby" German and Abigail "Abby" Williams went for a hike near the Monon High Bridge in Delphi. It was the last thing they would do before they died. It was the last day they would be seen alive. The search for their killer continues. Here's a look at what has happened since that day. Liberty "Libby" German and Abigail "Abby" Williams were dropped off to go hiking near Monon High Bridge just east of Delphi, according to family. Libby posted a photo on her Snapchat account showing Abby walking across the old railroad bridge. Between 2:30 p.m. and 5:30 p.m. The girls had a set time to meet with family members to be picked up . After family could not locate the girls they contacted the Carroll County Sheriff's Department. The search was called off just before midnight. Family members continued to scour the area searching for Libby & Abby. All crews were called to the area near the Monon High Bridge to resume their search for Libby & Abby. The Delphi Fire Chief announced that they had found Libby and Abby, calling the discovery "not good." 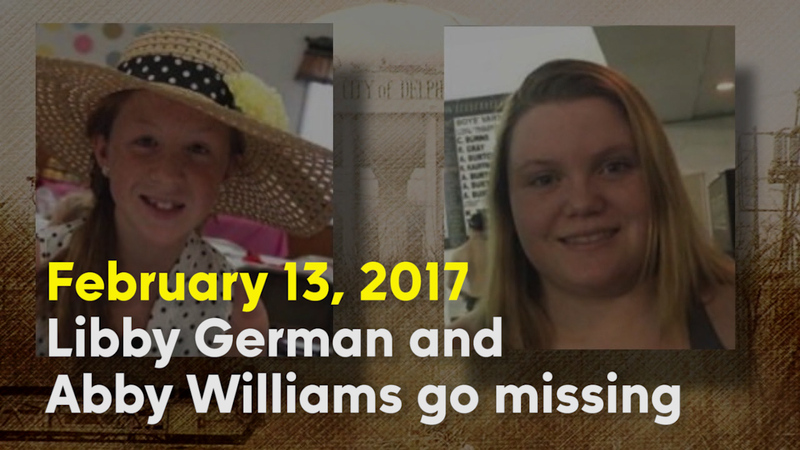 Authorities positively identify the two bodies found Tuesday as Abigail Williams and Liberty German during a press conference held in Delphi. Autopsies were performed earlier that day in Terre Haute, according to authorities. Indiana State Police released the photo above of a man they believe was on the Delphi Historic Trail around the time that Abigail Williams and Liberty German were there . A search warrant was issued at a home on Bicycle Bridge Road . Police spent at least two hours taking photos and collecting evidence from the scene. No arrests were made. Hundreds of investigators join the search for Libby & Abby’s killer. Thousands of people said goodbye to Libby & Abby during a public visitation for family and friends held at Delphi High School. The man in the photo is officially named a “prime suspect” in Abby and Libby’s murders. FBI and the Indiana State Police held a press conference, releasing audio from the day they were killed. Investigators say both the image and audio came from Libby’s cell phone. Listen to that audio here. She's been heralded as a hero for recording the video. The Delphi Murder Tip Line was routed to the FBI's Major Case Contract Center in Washington, D.C because of the sheer number of calls they were receiving. The tip line number is 1-844-459-5786. The FBI also announced that it is utilizing approximately 6,000 electronic billboards in 46 states to solicit information on the case. Community members begin to “ Light up Delphi ” by installing orange lights in their porch lights as a tribute to the girls. Investigators moved to a larger headquarters. ISP said the move was made to accommodate the city of Delphi, who has to use their building to conduct everyday business. The reward being offered for information leading to an arrest in the case of two murdered girls from Delphi was increased to $96,000 thanks to donations from the community and local businesses. Former Indianapolis Colts punter Pat McAfee and team owner Jim Irsay donated $97,000 to the reward fund to find the person who killed Abigail Williams and Libby German. Also that day, the families of Liberty German and Abigail Williams toured the Delphi investigation headquarters. Abigail William’s grandparents leave a message of encouragement for police on the board at the new Delphi headquarters. ‘Singing Contractors” release an emotional tribute to Libby and Abby to draw more attention to the investigation. Trail Safety Task Force formed to help improve the safety along the Delphi Historic Trails where Libby and Abby were hiking when they first went missing. Liberty German’s grandfather, Mike Patty, spoke to the media for the first time since the murders. Mike Patty talked about who the girls were, their love of softball and the family’s desire to find their killer. Indiana State Police say the reward has grown to over $220,000 and they are looking into over 11,000 tips in the case. Abby’s family speaks for the first time since the girls were murdered. Lucy Hubbard, Abby’s great-aunt, was the first member to speak out about who her niece was and their search for the killer. The case’s lead investigator speaks with Call 6 Investigates for the first time. After almost three months, 16,000 tips and 500 interviews, Delphi murder investigators admit it's been hard, but they're just as confident as they were on Day 1 that they'll find who killed Libby and Abby. State Police's First Sgt. Jerry Holeman sits down with Call 6 Investigates' Paris Lewbel to talk about the investigation. Family of Libby & Abby sit down with RTV6 for the first intimate interview since the two teens were murdered. Delphi Daughters: The Untold Stories of Libby & Abby aired on RTV6. The family announces they will be building a sports complex in honor of the girls. The location and full details were not yet released. The first memorial softball tournament was held in honor of Libby and Abby. Proceeds from that tournament will go toward the building of a sports complex in their memory. Investigators with the Indiana State Police released a composite sketch of the suspect in the murders of Abby Williams and Libby German back in February. The composite sketch was created after state police received new information from witnesses along the trail. Family members of Libby & Abby unveil the location and details of the new sports complex that will be built in their memory at the annual Delphi Bacon Festival. Libby & Abby’s families begin new efforts to find the killer , including a Facebook page and reaching out to national networks for coverage. Indiana State Police were contacted by a sheriff’s department in Colorado about similarities in their case against Daniel Nations and the Delphi murders . Daniel Nations was officially declared a ‘person of interest’ in the case. Detectives working the Delphi investigation travel to Colorado to interview Daniel Nations and “collect evidence” to try to determine if he has any connection with the Delphi murders. The murders of Libby & Abby got national attention when family members spoke with Nancy Grace discussed the case on the Dr. Oz show. The families of Libby & Abby appear on the Dr. Phil show to talk about the unsolved case. Following that appearance, investigators say their tips jumped more than 500 percent. Christmas in Delphi was tough for the families of Libby and Abby, but it didn’t go uncelebrated. “It’s been hard, we had a conversation a few weeks ago about whether or not we were going to put a tree up at home,” said Anna Williams. Indiana State Police say the base of operations for the Delphi investigation will move back to its original location at City Hall . An extraditable warrant was served on Daniel Nations for unrelated felony charges in Johnson County Indiana. At this time, Nations is the only man that has been named a ‘person of interest’ in the murders of Libby and Abby. Libby and Abby’s killer has still not been captured. Police hold a press conference to mark one-year since their murders. After one year, more than 30,000 tips have come in and the reward has shot to over $240,000. Investigators have interviewed thousands of potential suspects and around two-dozen people have been arrested on unrelated charges from those interviews. Libby and Abby's killer has still not been captured. Investigators hold a press conference to remind the public that the case is not cold and offer suggestions on what types of tips they need. Investigators hold a press conference to provide a "significant update" on the case. At the press conference, investigators release a new sketch of the suspect, new audio of the suspect speaking and new video of the suspect walking.